DHL Parcel and DHL eCommerce are now offering online retailers a global solution for their e-commerce fulfillment needs with a global fulfillment platform and new fulfillment centers in the UK, Americas and Southeast Asia, emphasizing once again Deutsche Post DHL Group’s aspiration to become one of the leading global providers in e-commerce logistics. Through DHL’s unique family of divisions Deutsche Post DHL Group is the most international company worldwide, present across 220 countries and territories and online retailers are able to leverage the Group’s strong global footprint for their e-commerce retail strategy. Today’s e-commerce market is placing aggressive demands on the retailer to provide fast fulfillment and delivery, and doing so without increasing costs. This is simply not possible for most merchants because they lack capital or the ability to manage the complexity. DHL has built a new IT platform that provides seamless access to a network of fulfillment centers and is closely integrated with DHL’s shipping capabilities to allow our customers to meet their fulfillment and shipping requirements in a much more efficient fashion. DHL is investing in this platform as well as in expanding its fulfillment centers in key international markets, enabling retailers to reach their consumers worldwide. 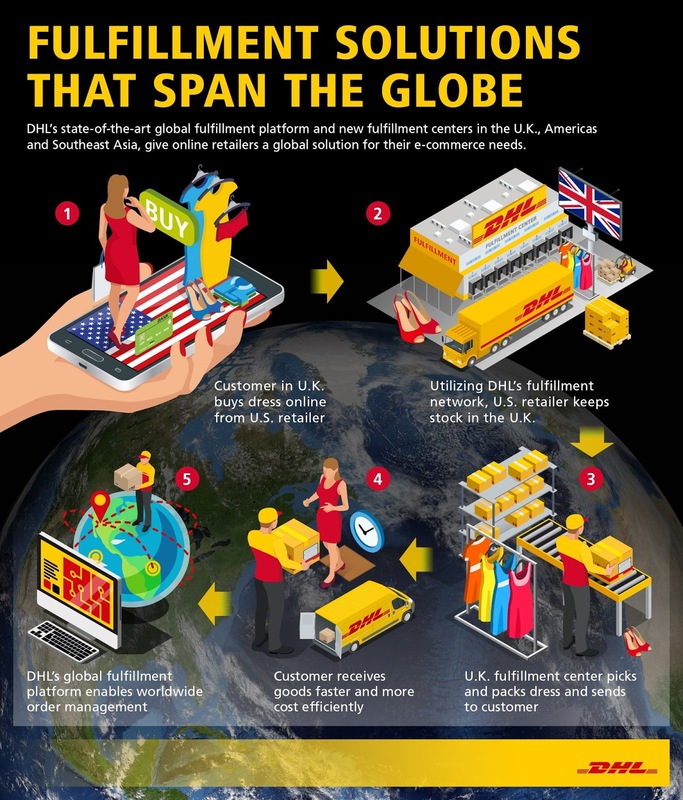 With existing fulfillment centers in the US, Mexico, Colombia, Hong Kong, India, Australia, Germany, and now in the UK and Southeast Asia, DHL already covers major e-commerce markets with its own presence and will expand these further in the future. Situated near London on an area of about 6,500 square meters, the latest addition to the fulfillment network in the English town of Radlett, offers great potential for same-day processing for the Greater London area due to the center’s good transport links. Apart from the center in Radlett, DHL is already working on the expansion of its fulfillment centers across other European markets, like the Netherlands, Poland or Switzerland. The new IT platform allows DHL to provide online retailers with access to all of these important e-commerce regions from a single source. This ensures simple and secure data synchronization as well as an easy connection to new business locations or regions since a reintegration is no longer required. “Online retailers don’t have to look for new logistics partners anymore if they want to expand their international reach,” Gerdes says. By directly integrating the new DHL solution into the webshop of the relevant retailer, the business can access different reporting options in real time and view current order data, for example, or the stock of individual products. More and more retailers and companies recognize the increasing importance of smooth fulfillment processes because traditional approaches that are aligned with individual sales channels have long since failed to satisfy the purchasing habits and expectations of modern consumers. Today’s consumers not only want to be able to shop at any time and in any place, but also want to have their goods delivered at any time and in any place. Without the behind-the-scenes logistics processes that effectively orchestrate the movement of goods through multiple sales channels, and a highly fragmented fulfillment landscape hassle a free shopping experience would not be possible for the consumer.